2nd Floor- Open loft bedroom with 2 twin beds. One of the more romantic cottages we offer for rent, this beautiful newer cottage on the shores of Pigeon Hill Bay is a great retreat for honeymooners or a small family looking to get away from it all. 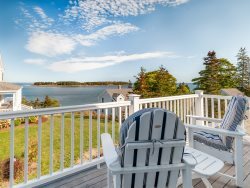 Close to the villages of Steuben, Milbridge, and the entrance to the Schoodic Point section of Acadia National Park, this property is also a wildlife lover's dream. Despite the label that this property is on an island, it is easily accessible by car over a causeway. With views from every room, you will love preparing meals in this kitchen with stainless steel counter tops and appliances. Curl up on the couch on a cool day and warm up by the gas fireplace stove while watching birds on the bay. At low tide, clam diggers work along the shore. Be sure to introduce yourself and buy some of Maine's most delicious natural treat. Live Lobsters and Crabs may also be purchased daily from nearby Dorr Lobster Pound, also located on Bar Island. NEED EXTRA ROOM? Our newest property is a great "addition" to this rental. Just a short distance away, this one bedroom can accommodate another two couples (4 guests), while remaining close to the rest of the group. Click HERE to visit the Port Side on Bar Island property page. CLEANING FEE: A $60 Cleaning Fee is added to the reservation to cover part of the cleaning costs. Internet Access: Yes - Satellite Internet with Wi-Fi (talk to us if you aren't familiar with satellite internet service and how it works) - Service is NOT set up for streaming movies - guests should not use it for that purpose - just to check e-mail and do light browsing. The Millbridge Library does have great internet service. Bruce was very good about contacting us and making sure everything was working at the cottage. The view was fantastic. It was great to find the kitchen with so many extras that we do not usually get when renting vacation homes. Beautiful panoramic views and very quiet. Easy to work with, we had no issues so did not need to contact anyone. Bruce stopped by just to make sure all was well, very nice and helpful. We had an absolutely lovely stay. The cottage is beautifully appointed, we loved every minute of our stay. The windows are so great to just sit and gaze out. Very helpful and informative , instructions and information given well in advance , easy to contact if needed . Secluded location , complete privacy with amazing views over the bay.The cottage is light and airy ,very well equipped and well maintained .It was just as described on the web site . We went to relax and spent hours watching the tides , the sunsets and the wildlife . Professional - efficient- responsive. Thanks! This is a truly rare experience in Maine, even for those of us who have visited the coast often. The property sits alone on a point near the head of a tidal inlet, facing due west. Sunsets last a hour; breeze from the ocean is constant, and this is dark sky country - amazing! When we weren't sitting on the open porch watching the natural world go by, we were relaxing in a beautifully simple open interior with all the amenities we needed. wonderful working with you. been very sweet to talk to when i called. love this place. being on the ocean and watching the sunsets are wonderful.so private and quiet. we been renting for 5 years at same place would not change a thing. Easiest and quickest reservation and contract execution I have experienced. Everyone I have dealt with at the agency is friendly and helpful. Don't want to use any other agency because the process is so easy and the availability calendar is up to the minute current so there are no disappointments later finding out something isn't actually available. Location on calm water area with easy access to the water from the small pebble beach during high tide. Deck and water view from all areas of the house. The privacy and quiet location. Radiant floor heating and gas fireplace heater. The layout of the house is great for a couple. Clean and comfortable. Too many favorite features to list! In my interactions with your reps, they were friendly, responsive and clear. The Bar Island cottage is a great location to watch the tides and to kayak in protected waters. Wonderful view from anywhere in the house. At low and mid tide, there is a narrow gravel beach (adjacent to the stone steps to right of cottage) that works to launch a kayak or retriever into the water. The Bar Island cottage is a well designed and well build cottage. It's furnishings are very functional and uncluttered, giving it a feeling of serenity that fits the location. The views of the protected bay are simply great. The kitchen is well furnished and useful. About amenities, as a rural property with satellite internet service, bandwidth has a monthly cap. If prior renters use up the 15 GB monthly allowance, internet service is super slow/ barely useful. Cell phones with hot spot capability work as alternatives. It could be a good idea to give heads up to future renters that bandwidth is likely to be limited in case they count on getting online while on vacation using the property's bandwidth. We love the quiet, we love the water, we love the trees, we love the birds. We hope to return. You have a very detailed process and it worked well although some of the reminders were a bit much towards the end. I would imagine it is necessary to ensure all goes smoothly and it did so I will say it was a good experience. I would use your services again. Loved the location, quiet, secluded and right on the water. The cottage was spacious, bright, cheery, beautifully decorated and offered water views from every window. The wrap around deck provided plenty of seating space in or out of the sun. Our only "visitors" were locals, seagulls, Osprey fishing in the waters in front, 2 seal visits, crows, a beautiful bald eagle who flew right over our heads and a hummingbird who "buzzed" us daily. The location was perfect for numerous day trips and I have nightly pictures of the wonderful sunsets. Lovely! This was our second summer staying at the Bar Island home, and it was just as wonderful this year as it was the first. It's peaceful, beautiful, and gorgeously designed. On the Water in Maine were easy to work with and all went very smoothly. Thank you for sharing the your cottage it was perfect for four of us. We had family staying on Bar Island road and spent our days with them and nights at the cottage. They answered each of my laborious questions quickly helped me with the information I needed. We appreciated the incredible attention to detail for all the things that we would possibly need during our stay. At the same time the house was not cluttered with knick knacks, making it effortless for us to move in with our belongings. The aesthetic sensibilities of the interior of the house was also noted and admired. A bit complicated, but for understandable reasons. Worked well!! The agency was very helpful and gave us very clear directions. The view is breathtaking! We were able to get away for a few days without our kids so we really wanted quiet and privacy and we go exactly that. Beautiful and clean property as well! Working with "One the Water in Maine" was effortless. Website was very easy to work through and the staff was very helpful and friendly when speaking with them on the phone. The reservation, contract, and payment was seamless. The electronic combination lock at the property made things very easy. Absolutely love the privacy of the Bar Island Cottage. The cottage had everything we could want regarding kitchen items. Bathroom was perfectly sufficient, although a hair dryer would have been nice. Had great fun watching the tide roll in and out. The views of the water and of the night sky were outstanding! Cottage was quintessential Maine! The minute we arrived, we knew we were at the right spot, and talked about coming back. On the Water was fabulous, easy, helpful and patient with all my questions. We totally want to rent from you again!!!!!! We absolutely loved how clean it felt. The couches were a little low and the small spoons were really small - can you tell I'm digging for problems? We just loved the place. Even the bed was super comfy!